Winner of the 2018 World Food Prize and Executive Director of GAIN, Lawrence Haddad. San José, Costa Rica, 8 February 2019 (IICA). More than 150 specialists representing public and private entities, as well as NGOs, participated in the II Global Conference of the Sustainable Food Systems Program of the United Nations (UN) One Planet Network, which was held at the Headquarters of the Inter-American Institute for Cooperation on Agriculture (IICA) in Costa Rica. 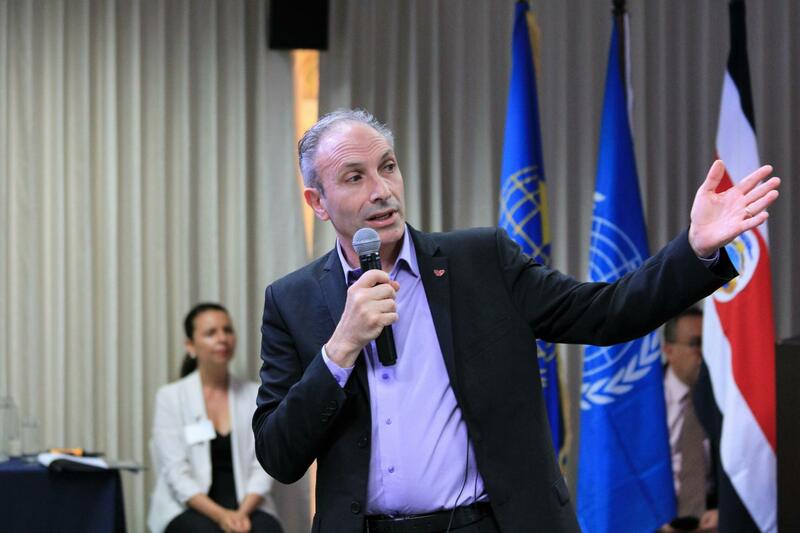 Among the experts who participated in the event were Lawrence Haddad, winner of the 2018 World Food Prize and Executive Director of the Global Alliance to Improve Nutrition (GAIN) and Bernard Lehmann, Secretary of State and Director General of Switzerland’s Federal Office for Agriculture, who were welcomed to IICA’s Headquarters by Costa Rica’s Minister of Agriculture and Livestock, Renato Alvarado. Participants focused their presentations on the need to transform food systems by using a comprehensive and systemic approach to tackle a harsh reality: 821 million people in the world are suffering from hunger, while 33% of the population is wasting food or is suffering from some type of malnutrition or obesity. Moreover, the rate at which we are using our natural resources is outpacing the planet’s capacity to regenerate these resources. Lehmann argued that, “We must transform our approach to producing and consuming food, ensuring that the ecosystem will be productive for upcoming generations. Therefore, if all actors in the value chain are part of the problem, they should also be part of the solution”. A sustainable food system is one that supplies nutritious food that is accessible to all and is one in which the management of natural resources preserves ecosystems, ensuring that current and future human needs will be satisfied. The authorities and specialists attending the event all agreed that any substantial progress in this area will demand political will; the development of joint initiatives involving all actors; innovation; and most of all, the inclusion of the agriculture sector and farmers, who stand to play a pivotal role in the change that will be required. Lloyd Day, Deputy Director General of IICA concurred, pointing out that sustainability begins with farmers, since they are the ones who take the best care of the land, given that they depend on it not only to feed the world, but also as the source of income and well-being for their families. “Moreover, the incorporation of science is critical to understanding what is happening to the planet, and also to assisting us to improve our options to produce food more intelligently – by producing more with less”, added Day. Deputy Director General of IICA, Lloyd Day, participating in the Global Conference. Behind, seated at the head table, are Renato Alvarado, Minister of Agriculture of Costa Rica, and Marvin Rodríguez, second Vice-President of the host country. On the other hand, the winner of the 2018 World Food Prize and Executive Director of the Global Alliance for Improved Nutrition spoke to the trends and emerging challenges with respect to sustainable nutrition. Haddad stressed that, “We have to connect producers to markets, and to underscore the importance of nutrition and its impact on health. One of the key messages is that we have to stop talking about feeding the world. That is a misguided goal. The correct approach is to feed and provide nutrition, while ensuring sustainability. That is the challenge: to feed the world in a sustainable manner”. He concluded by stating that, “We have to adjust our focus, in terms of legislation, policies and creating the proper and appropriate pricing to allow the population to access healthy food, taking into account external factors, such as health and the environment”. The II Global Conference of the Sustainable Food Systems Program of the UN One Planet network is being hosted by the Government of Costa Rica, under the leadership of the Ministry of Agriculture and Livestock (MAG), the Government of Switzerland, UN Environment, HIVOS, and the Worldwide Fund for Nature (WWF), with the support of the Government of Germany, IICA and the United Nations Food and Agriculture Organization (FAO).